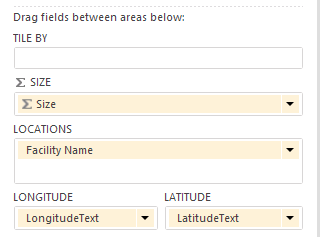 The categorization didn’t initiallly occur to me as I was telling the map chart exactly what fields to use for Latitude and Longitude; I thought that was enough indication. Apparently the category is treated as secondary to the data type. Therefore, one must type latitude and longitude fields as Decimal Number. This of course works with a filled map filtering a regular map and vice versa. In a future post I will work through this last example step by step. It uses diverging coloring with custom minimum and maximum population values to color the top map, and ranking in DAX to display the top 10 most populated counties. Get a sample Power BI Desktop file here. 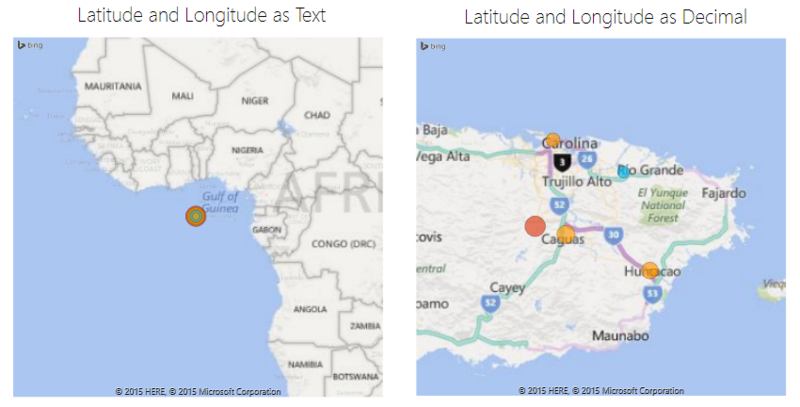 Ease of navigation between data model and visualizations. No more switching between windows. 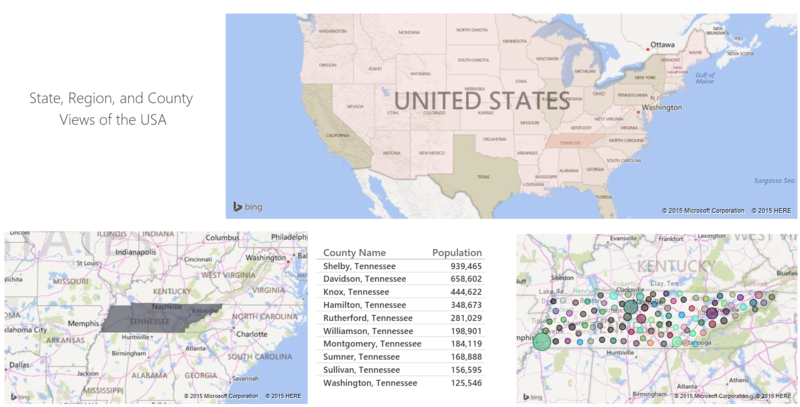 One-click publishing to powerbi.com. It couldn’t be easier. The new visualization types and the potential market for third-party visualizations. The many (and growing) list of data sources. More control over chart customization (e.g., colors, titles, etc.). For many people this was a reason for looking at other products and a let down when compared with Excel charts. Seamless integration between data, data transformations, and data model. Again, no more switching between windows. The unity of interface between the Power BI Desktop and the report editor in powerbi.com. The placing of measures in the fields list of a table. I could never get my measures to look right at the bottom of the grid and was always playing with the column widths. Now measures are first-class citizens. The elimination of the colon for defining measures. Perhaps a minor detail, but syntax simplification and uniformity is always welcome. The ability to connect to and build reports from tabular models without having to import data. Another huge reason to not look at other products. The promise of frequent updates and improvements. This should keep the excitement going. The fact that the community’s input is actively being sought and paid attention to. It’s great when you submit a smile or a frown and you get a response for more information. The play axis for scatter charts. Hierarchies in the data model. Column filters in the data view.